Jay Z’s World Tour To Stop Over In Lagos on October 9 - Corpr! Lagos has played host to a number of Hollywood stars and the Nigerian capital is set to host its biggest star as hip hop rapper and president Def Jam Music; Jay Z is set to perform in Lagos during his forthcoming world tour. Shawn Carter, announced his world tour on Thursday, and the tour will include performances in seven African cities, including Lagos. The tour which will kicks off on September 9 in Poland, will see the multi-Grammy award rapper perform in Accra, Lagos, Cape Town, Luanda, Durban, Johannesburg and Dar Es Salaam. His highly anticipated performance in Lagos is scheduled to hold on October 9 at Ocean View restaurant. This will be Jay Z’s third visit to Nigeria. 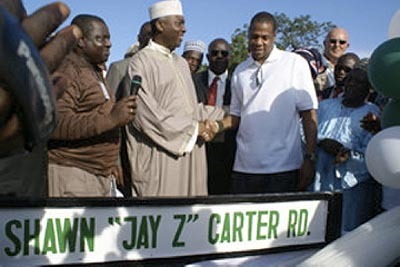 He and his superstar wife; Beyonce, were hosted in 2006 by the former Governor of Kwara state; Bukola Saraki, who named a street after the American rapper in Ilorin, the Kwara state capital. Jay Z was also part of the ThisDay Music festival with a host of other global music icons that performed in West Africa’s entertainment and culture capital city, Lagos. Previous story Batch B 2013 NYSC Mobilization Time Table Is Out! !